郭冰玉, 回蔷, 常鹏, 陶凯. miR-489通过打靶PAK5抑制黑色素瘤的迁移[J]. 中国医科大学学报, 2018, 47(4): 355-357, 363. GUO Bingyu, HUI Qiang, CHANG Peng, TAO Kai. miR-489 Inhibits Melanoma Migration by Targeting PAK5[J]. Journal of China Medical University, 2018, 47(4): 355-357, 363. Abstract: Objective To investigate the role of miR-489 in inhibiting the migration of melanoma cells.Methods The effect of miR-489 on the migration of melanoma cells was detected using the Transwell assay. Luciferase reporter gene assay was used to detect the effect of miR-489 on PAK5 in A375 human melanoma cells. Western blotting and real-time PCR were performed to test the effect of miR-489 on PAK5 in A375 cells.Results The Transwell assay showed that overexpression of miR-489 could significantly inhibit the migration of A375 cells, and that the migration of A375 cells was promoted when miR-489 was inhibited. 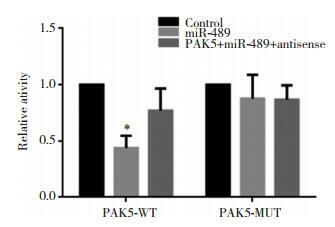 Luciferase reporter gene experiments demonstrated that miR-489 could act directly on PAK5. Western blotting and real time PCR assay showed that overexpression of miR-489 could inhibit the expression of PAK5 protein in A375 cells, and the expression of PAK5 was increased when miR-489 was inhibited.Conclusion miR-489 can inhibit the migration of melanoma cells by targeting PAK5.